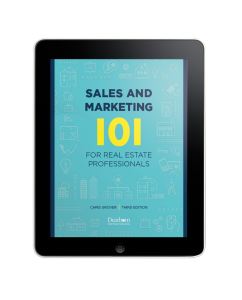 There are many marketing texts and many real estate salesmanship books, but few that explain marketing principles from a real estate agent’s point of view. The course integrates the four elements of a balanced marketing mix – promotion, place, product, and price. Throughout the course, principles of market research, data analysis, and market segmentation are applied to make the reader a more efficient salesperson. New to this edition, new units on technology, online marketing, and social media strategies make this the most comprehensive how-to guide for applying classic marketing and sales techniques to a real estate career.